Place strawberries in a heatproof bowl. Combine water, sugar, vanilla, lemon zest, and peppercorns in a small saucepan over medium heat. Bring to a simmer, and cook for 1 minute. Pour syrup over strawberries. Let stand until cool, about 15 minutes. I served this over vanilla ice cream. 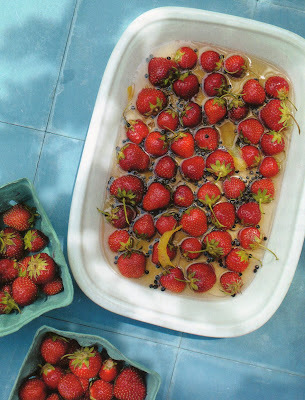 You can easily spoon out the strawberries without getting peppercorns if the idea of them scares you, but they bring an unusual heat to the syrup. Give it a try!